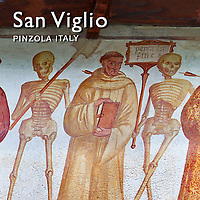 Pictures of the Church of San Vigilio in Pinzolo and its famous painted mural known as the “Dance of Death” ( Danza macabra ) by Simone II Baschenis. The Baschenis family were well known in the valley of Bergamo where they came from and in the valleys of the western Trentino for the religious paintings they made on the interior and exterior church walls of the area. The Medieval preoccupation with the imminent arrival of the end of the earth and the second coming carried on into the Gothic and early Renaissance periods. The Roman Catholic church made great use of this fragility by selling the idea that sin would lead to long periods spent in purgatory where the deceased would be tortured to purge them from sins. The Popes then sold indulgences which lessened the time spent in purgatory for an individual before death of for departed members of families. It is against this backdrop that the painting of Simone II Baschenis should be viewed. The “Dance of Death” ( Danza macabra ) is a powerful visual reminder that death awaits for all of us. The Mural opens on its left with a skeleton on the throne, bearing a sceptre and the crown and playing a bagpipe. These skeletons are playing the music which is the backdrop to “Dance of Death” ( Danza macabra ) and suggests that they are playing with our fate on earth. The mural continues for another 21 meters with a long procession with 40 figures. To the right of the skeletons playing music is a depiction of the crucification. Christ is depicted on the cross with an arrow in him that has been fired by a skeleton with a bow. This suggests that because Christ was a man he suffered the fate of death as we all will. After Christ is a Pope also pierced by a spear, as are all the human figures in the mural. Next to the pope is a cardinal, a cleric and a monk all of whom have succumbed to the arrows of the skeletons. This tableau is a reminder to the hierarchy of the church that even they are not immune from death. The procession continues with a depiction of a king then nobility followed by knights and soldiers and a beggar man with no legs. Between each figure are skeletons holding bows and arrows, banners with writings on them or a shovel to dig a grave. After the beggar mad there are figures of women ending with a small skeleton and a cherub. To the far right a skeleton on a horse is riding into the procession holding a bow and arrow ready to far. To procession ends with the Angel Gabriel and the devil discussing the fates of the those in the procession as to whether they go to Heaven or to Purgatory and Hell. Simone II Baschenis has painted the “Dance of Death” ( Danza macabra ) in a powerful direct style and each part of the procession is accompanied by texts to reinforce the message to those who could read.